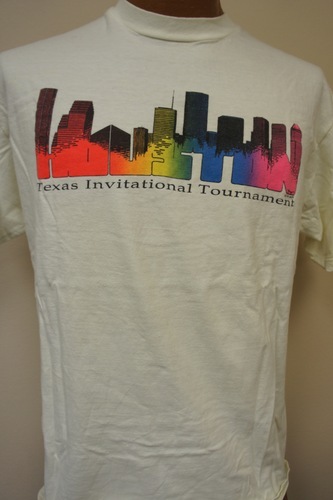 Back: "Texas Invitational Tournament Houston"
Rainbow image of Houston skyline. Bowling tournament. 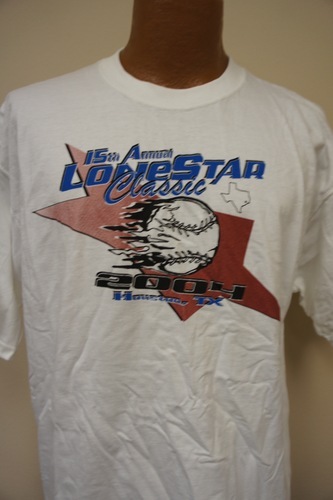 Front: "Lone Star Classic. 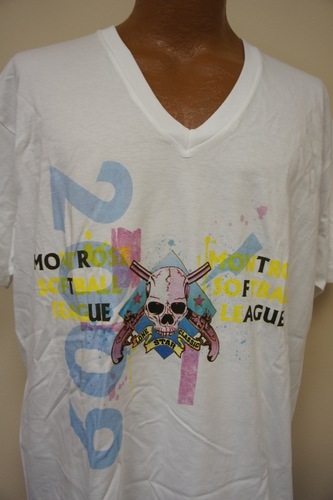 Montrose Softball League 2009"
Front: "'91-'92 Houston Thursday Mixers. Girls! Girls! Girls ? 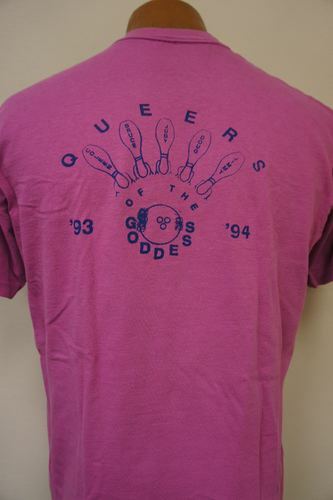 Bruce, Judy, Jim Coleen, Mike"
"Queers of the Goddess '93-'94. Coleen, Bruce, Judy, Doug, Jimmy"
Front: "Lone Star Classic. 17th Annual Lone Star Classic. 2006. Houston, Texas. 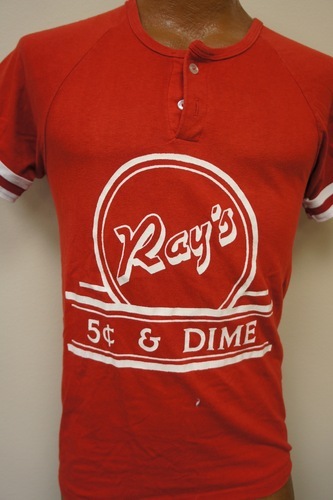 MSL"
Back: "Lone Star Classic Softball Tournament 2006 sponsors"
Front: "Ray's 5 cents & Dime"
Sleeve: "MSA South Division Champs 1984"
"Lone Star Classic. 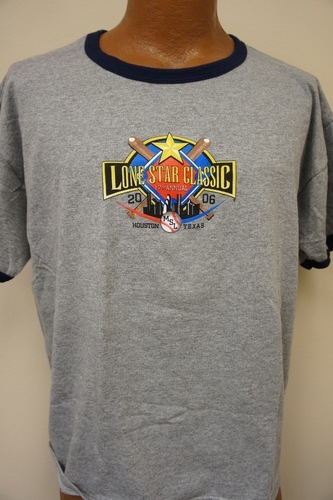 19th Annual Lone Star Classic. 2008. Houston, Texas. 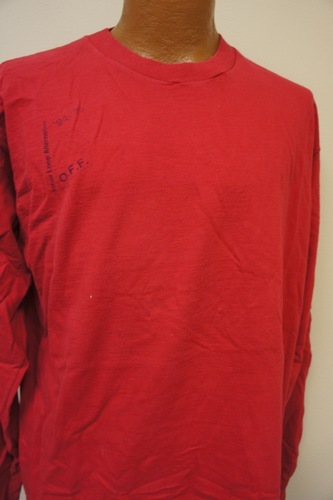 MSL"
"Inner Loop Allernative "O.F.F. 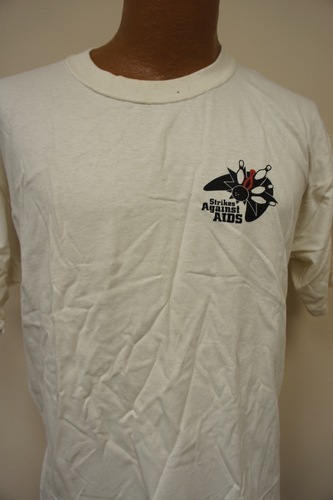 '94-'95"
Origin Unknown. 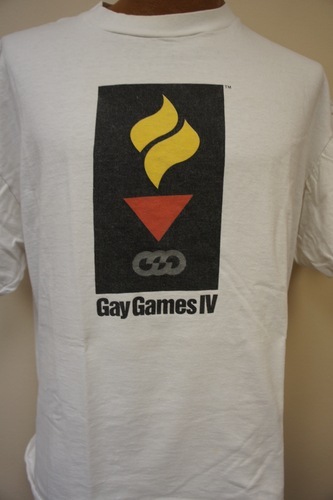 Please contact Wearing Gay History if you have any information regarding this t-shirt. 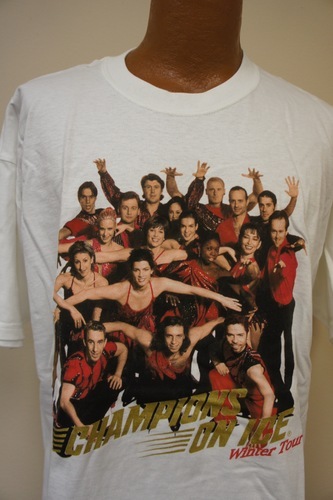 "Lone Star Classic Houston, Texas 2000"
Front: "Champions on Ice Winter Tour"
Back: "John Hancock Champions on Ice Winter Tour 2001. Boosier City, LA. New Orleans, LA. Little Rock, AR. Atlanta, GA. Providence, RI. Durham, NH. Portland, ME. Albany, NY. Trenton, NJ. Hershey, PA. Wilkes-Barre, PA. Rochester, NY. Columbus, OH. Grand Rapids, MI. Rockford, IL. Topeka, KS. Raleigh, NC. Fort Meyers, FL. Macon, GA. Birmingham, AL. Houston, TX. Lubbock, TX. Lake Charles, LA. Tupelo, MS. Greenville, SC." Image of a bowling ball. 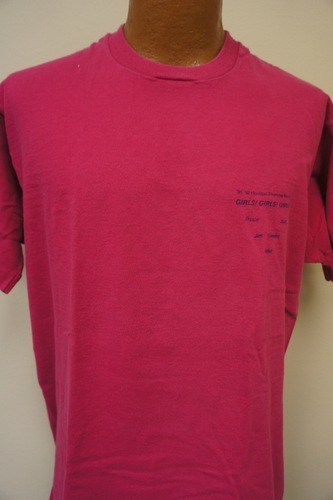 Front: "Girls R Us. 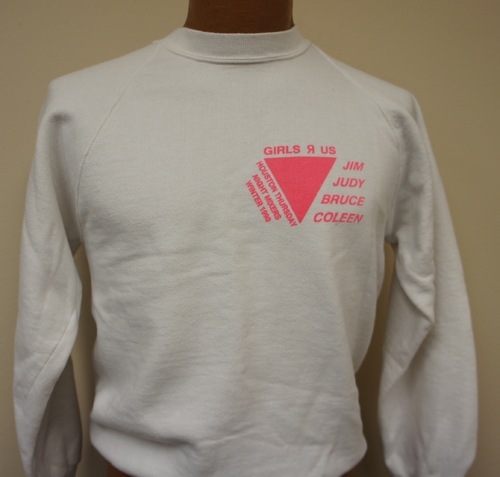 Jim Judy Bruce Coleen. 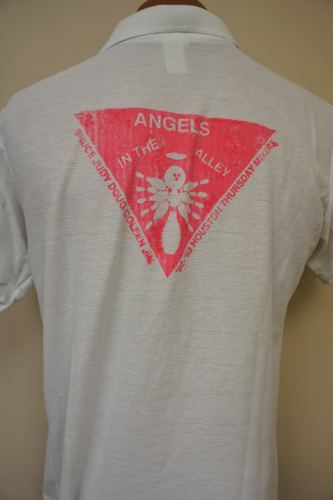 Houston Thursday Night Mixers Winter 1990"
Front: "Angels in the Alley"
Back: "Angels in the Alley. Bruce, Judy, Doug, Coleen, Jim. 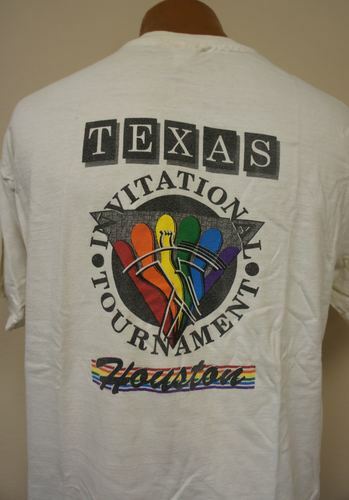 '92-'93 Houston Thursday Mixers"
"MSL. 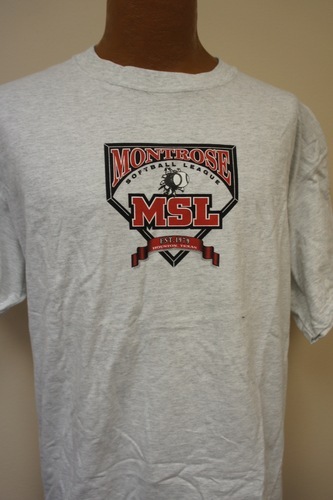 Montrose Softball League. Est. 1979. 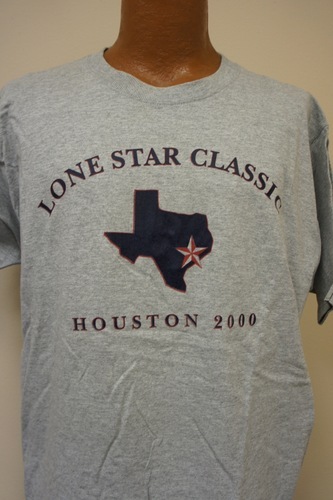 Houston, Texas"
Front: "15th Annual Lone Star Classic 2004"
Back: "Houston, Texas May 29-30" List of participants. 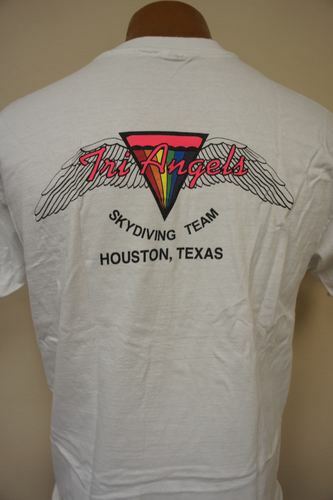 Back: "Tri Angels Skydiving Team, Houston, Texas"
Tri-Angels, a Houston-based gay and lesbian skydiving team. 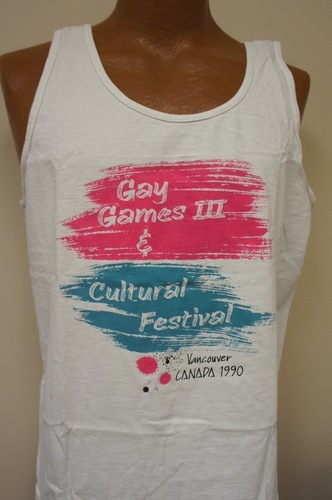 "Gay Games III & Cultural Festival. 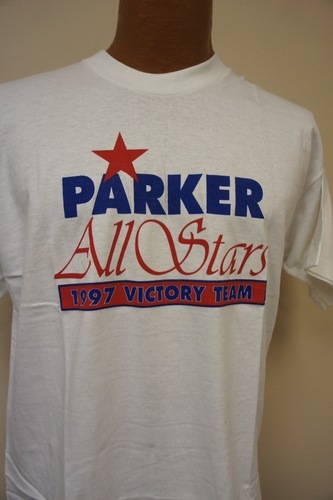 Vancouver, Canada 1990"
Back: "Unity '94 New York City June 18-25, 1994"
Front: "Parker All Stars. 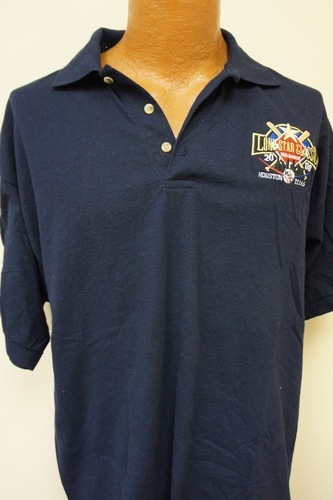 1997 Victory Team"
Back: "Life shrinks or expands proportion to one's courage. 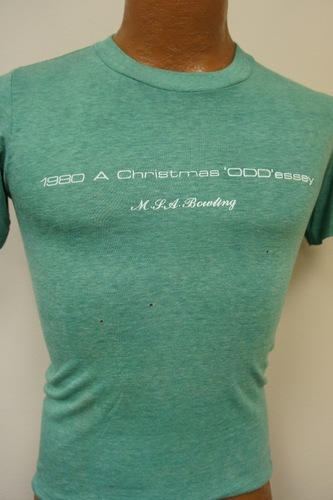 -Anais Nin"
"1980 A Christmas 'ODD'essey. M.S.A. 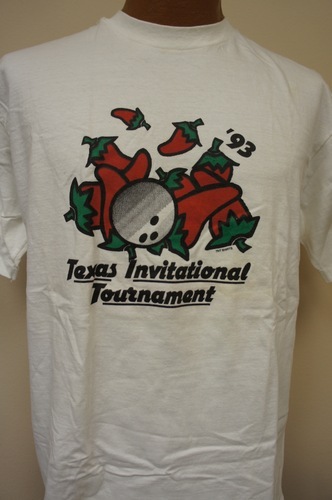 Bowling"
White t-shirt. 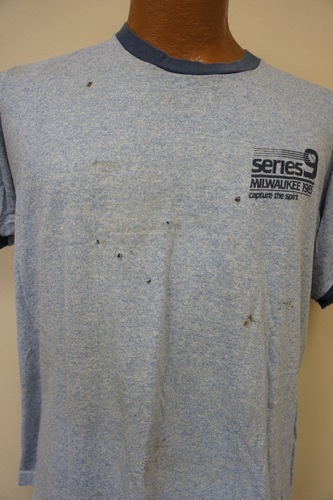 T-shirt damaged, irregularly torn. 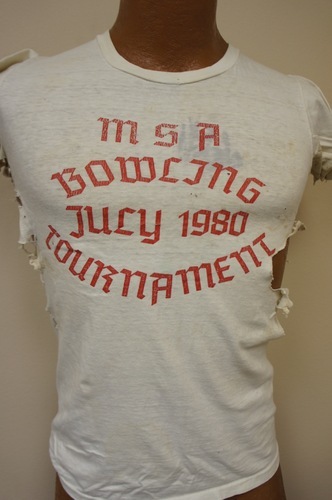 "MSA Bowling Tournament July 1980"
Front: Image of a pink triangle and softball. 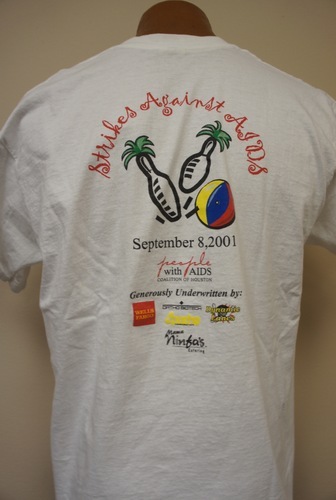 "2006"
Back: "1st Annual AssistHers Softball Tournament. Sponsored by Gay & Lesbian Yellow Pages. Chances. Play it Again Sports. Uppercuts Barber Shop." 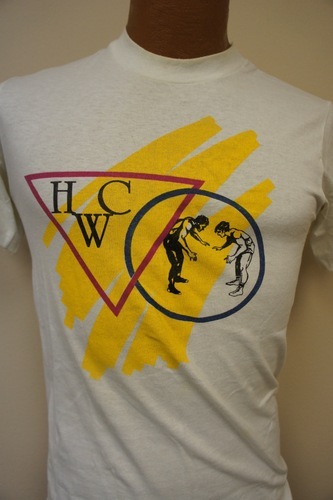 Image of two men wrestling. 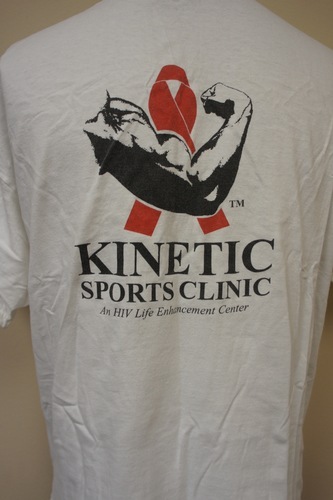 "HWC"
"Kinetic Sports Clinic: An HIV Life Enhancement Center"
"Series 9 Milwaukee 1985. Capture the Spirit"
Gay Softball World Series 9 held at Mitchell Park. 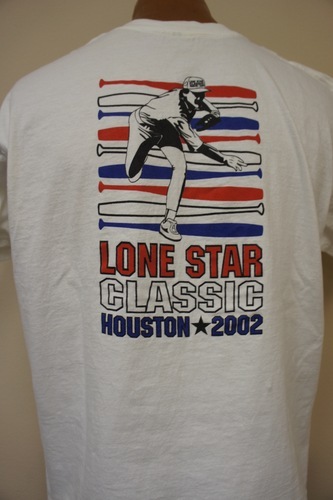 Front: "Lone Star Classic. 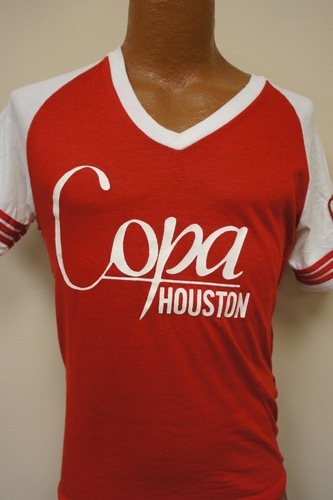 Houston. 2002. 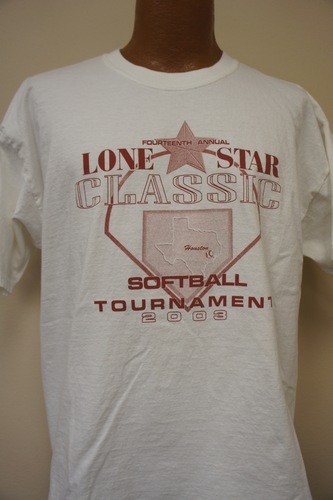 MontroseSoftballLeague.com"
Back: "Lone Star Classic 2002"
"Fourteenth Annual Lone Star Classic Softball Tournament 2003. 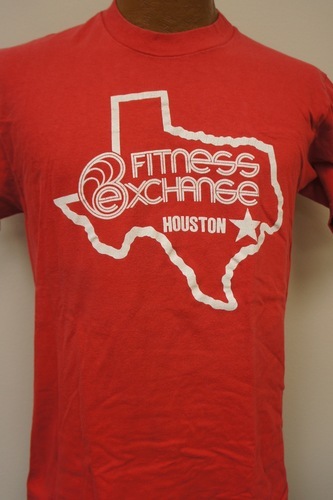 Houston"
Front: Image of bowling pins and beach ball.